It’s not often we see new progressive jackpot pokies from Net Entertainment, but Divine Fortune has been well worth the wait. Find out more about this exquisitely designed online slot game with the potential to reward some huge wins, and discover the best online casinos to play Divine Fortune for real money bets. 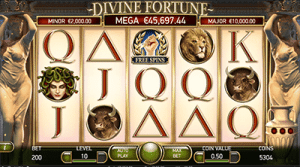 Divine Fortune is a five-reel, three row pokies game with 20 fixed paylines. It features wild symbols, scatter symbols and multiple bonus features, including free spins and a progressive jackpot bonus game. 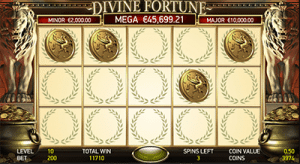 It uses an ancient Greek theme, which we’ve seen done in many online pokies games before, but it’s safe to say no other software provider has pulled off the Grecian design quite as elegantly as NetEnt has in Divine Fortune. Come for the flawless design and intense soundtrack, stay for the massive winning potential. Divine Fortune runs on NetEnt’s wide area progressive jackpot network, which means the jackpots on offer increase any time a bet is placed on the game anywhere within the linked network. Due to this, Divine Fortune is best played for real money bets, although free play in practice mode is also allowed. 1. Sign up for an account at a trusted online casino, like any of the casinos recommended in our table above. Register using our links and you’ll be eligible for some exclusive new player welcome bonuses. 2. Make a deposit using a reputable payment method like credit card, web wallet, pre-paid card or bank transfer. 3. Load Divine Fortune for instant-play directly over your Web browser – there are no downloads required. 4. Use the buttons at the bottom of the reels to set the size of your bet, including the bet level and coin value. Paylines are fixed, with a minimum bet of $0.20 required and maximums capped at $100 per spin. 5. Hit the spin button to play, or use the auto-play feature to have the computer place spins for you. Any winnings you make will automatically be credited to your account. 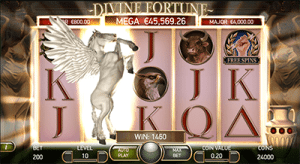 Divine Fortune is available for desktop and mobile play and is compatible with both iOS and Android operating systems, making it suitable for play on all data-enabled smartphones and tablets. 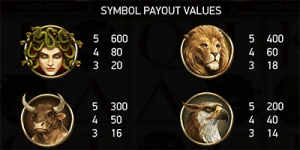 Falling Wilds Re-spins – Every time a winning wild symbol appears it shifts down one position after the win has been awarded and is replaced with another symbol, before a free re-spin is awarded. Wild symbols continue to activate Falling Wild Re-spins until no more wilds appear on the reels. This bonus is awarded in both the main game and during free spins and can also trigger the free spins bonus or the jackpot bonus. Wild on Wild Feature – Any time a wild symbol lands behind a Falling Wild, the Wild on Wild feature is activated. When this happens, the wild symbol in question expands to cover the entire reel, awarding all bet wins for that spin. All active wild symbols on the screen will shift down a position and trigger a Falling Wilds Re-Spin. Free Spins – The free spins bonus is triggered by an appearance of three or more of the hand grasping lightning bolt scatter symbol. Three scatters award five free spins, four scatters award eight free spins and five scatters award 12 free spins. During free spins, all wild symbols become Wild on Wilds to cover the entire reel, making some huge wins possible. Jackpot Bonus Game – Every time you collect a bonus coin symbol on a winning payline in the main game, the coin goes into the urn sitting at the bottom right hand corner of the reels. Once you’ve collected three or more coins, you’ll trigger the jackpot bonus round where you get the chance to win one of three progressive jackpots. The coins you’ve collected are placed at random on to the reels before the Jackpot Bonus begins, with reels spinning in the hopes you’ll land more coins on the board to complete a whole row. Completing one row of symbols will win you the Minor Jackpot, completing two rows of symbols will win you the Major Jackpot and three row will win you the Mega Jackpot. The current value of each progressive jackpot is updated continuously and displayed at the top of the screen. It’s hard to fault this game. For one, it looks spectacular and plays out very smoothly, and secondly, there is some strong reward potential lying within. During our testing, it felt like the wins just kept coming, especially with the addition of the Falling Wild Re-Spins, which really amped up the excitement. We were able to trigger the Jackpot Bonus quite easily, which awarded some sweet wins despite not triggering any of the progressives. All up, Divine Fortune is one of NetEnt’s finest and has certainly started the developers 2017 collection on a high note.